There is no real contradiction between his action in 1905 and his collusion with the nascent Zionist movement only 12 years later. Balfour, like many of his class and time was steeped in antisemitic attitudes. He was too ‘civilised’ to enact pogroms or worse but he would rather there were fewer or no Jews living near him. So the Aliens Act was to keep them out and the Declaration, to “view with favour the establishment of a national home for the Jewish people”, was to encourage those who had managed to arrive to move elsewhere. That they should go to Palestine accorded with his Christian Zionist beliefs that the second coming would only happen when the Jews were foregathered in Israel to convert or die. The homeland, note a homeland and not a state, offer had two conditions. Firstly, nothing should be done to prejudice the “civil and religious rights” of Palestine’s “existing non-Jewish communities.” A condition the existing population viewed with scepticism at the time, a scepticism all too fully justified by later events. Secondly, the declaration should not affect “the rights and political status of Jews living in any other country”. The paucity of these conditions was solely argued by the only Jew in the Cabinet, Edwin Montagu, who feared that the creation of the homeland would mean that Jews would be viewed as foreigners in Britain and elsewhere. He also foresaw that the native Muslims and Christians would become foreigners in their own land. The only legitimacy on which the Declaration was based was the deep belief that Europeans had an absolute right to possess and allocate the territory of any Black, Brown or Yellow people as they wished. The Declaration followed on the notorious Sykes-Picot agreement of 1916 which divided the lands of the collapsing Ottoman Empire between Britain and France. The agreement created the arbitrary borders and puppet states, and we are still living through the bloody consequences. Sykes-Picot defined and allocated Palestine to the British sphere of influence to be disposed of by ‘statesmen’ in London. There was a longstanding, but relatively small, Jewish community in the territory which was augmented by a wave of Jewish emigration from Europe. This was, perhaps, the final act of European colonisation but it differed in a critical way from earlier occupations of the United States, Australia, the Caribbean and elsewhere. Those land seizures were from hunter-gatherer civilisations with no established settled land rights. These communities could be driven from their land into reservations and decimated or eliminated. Palestine’s population was different; while there were also nomadic Bedouin, they were mainly settled farmers with established rights to the land desired by the incomers. There was no “land without people” awaiting “a people without land” as asserted by the Zionist leadership. Throughout the twenties and thirties, as the Jewish population grew, there was no effort to develop a safe space for Jews needing to escape increasing repression in Europe alongside, and in cooperation with, the native Arab population. From the start what became the Jewish Agency, the proto-Governmental institution, deplored interaction between Jews and Arabs, barring the existing inhabitants from working in Jewish enterprises. This segregation was justified as an inevitable consequence of trying to cleanse the Jews of their subservience in Europe. The new Jews were to be purified by their own manual labour and by replacing the decadent Yiddish with a reinvented Hebrew. Such purification projects are a common corollary of racism. Thirty years on from Balfour, and after the Holocaust, the United Nations, then a club of Second World War victors, took Balfour to the next stage. Ignoring the views and interests of the Arab inhabitants, they decided upon a partition of Palestine. Unsurprisingly, the Arab population did not take kindly to being partitioned out of rights in their own land. The well-equipped and trained Jewish forces of the formal army, the Haganah, and its terrorist auxiliaries of the Irgun and Lehi (the Stern Gang), began clearing the recalcitrant Arabs from their villages and fields in a belated effort to make real ‘the land without people’. The local population called for help from neighbouring states and the poorly armed and worse led Arab armies attempted to assist them. By the time the neighbouring countries intervened over half of the Arab population had already fled and the intent of the intervention was only to retain the residual fragment of Palestine offered by the United Nations. The war that followed was a disaster (the Nakba) for the Arabs of Palestine. Hundreds of thousands fled their homes to save their lives and contrary to International Law were not permitted by the new Israeli state to return to their homes when the fighting ceased. The Israelis had succeeded in grabbing more land by conquest beyond the borders of the United Nations grant. While most Israelis celebrated their newly expanded borders others believed the Zionist project envisaged by the Balfour Declaration remained only partially fulfilled. The historic towns of Bethlehem, Jericho and Hebron and half of Jerusalem were still denied to them. Israel’s military was continually strengthened and became ever more central to Israel’s own vision of itself as a state. In alliance with the British and French Israel attacked Egypt in 1956 in the Suez crisis but gained no extra territory when they were forced to withdraw because of US opposition to increased UK presence in the region. Israel’s next chance came in 1967. Nasser provocatively moved Egyptian troops through Sinai towards Israel but was pressed to withdraw them. Israel ignored the withdrawal and launched a pre-emptive attack destroying the Egyptian air force on the ground. With air superiority Israel rapidly moved through the Gaza Strip and Sinai. Unwisely Jordan and Syria responded to Egyptian appeals for help and Israel invaded and seized the Golan and the West Bank producing a new wave of refugees. While the world powers anticipated that Israel would withdraw from the invaded land, Israel had no such intention. Israel steadily moved from seeing the West Bank as a buffer zone, occupied by perceived military necessity, to seeing the occupation of the expanded territory, and, in particular East Jerusalem and the biblical lands of the West Bank, as the fulfilment of Balfour’s promise. Military invasion was swiftly followed by the first civilian invasion and settlements and the lines of the current conflict were established. Every year for the last fifty years illegal settlements have multiplied and expanded, while Palestinian self-identification as a people has deepened and gained increasing international recognition. In response to the growing reality of Palestinian peoplehood and nascent statehood, a major effort of Israeli statecraft and hasbara (propaganda) has been to seek to undermine the legitimacy of Palestinian identity but with little, if any, success. Palestinian resistance has gone through many phases, violent and non-violent. Since the end of the second intifada in around 2005, the emphasis has been on mass civil society non-violent action in the occupied territories; supported by its counterpart the global Boycott, Divestment and Sanctions (BDS) movement. Since the end of the intifada, Palestinian resistance has inflicted a relatively small cost of lives, injury and property on Israelis. Israeli repression has killed thousands of Palestinians; injured tens, maybe hundreds, of thousands of Palestinian, children and adults; and seen the destruction of countless homes, schools, hospitals, olive groves and more. Israel’s allies in the West, led by the United States, pay great attention to any Israeli loss while conveniently overlooking the pain and suffering of Palestinians as being of no account to those who believe themselves to be civilised. This lack of self-awareness allows them to regard Israel as a member of the club of ‘civilised’ Western nations, conveniently setting a low hurdle for admission to this status. The latest tactic of Balfour’s inheritors is to attempt to brand as antisemites all those who perceive the immorality of his heritage. They are alarmed that the mass of the Labour Party is coming to this view and becoming increasingly vocal in defence of Palestinian rights. Israel’s apologists inside the party seemingly mimic the attitude of American generals in Vietnam; they act as though they believe that the only way to save the party is to destroy it. They deploy the Party’s disciplinary machine as their own defoliant, their own agent orange. It is our responsibility to ensure that, 100 years on, the Balfour Declaration is seen as the arrogant appropriation it has always been; denounce any celebration of this act of robbery; and ensure that its legacy is overcome; condemning May’s collaboration in this circus of shame; resisting Labour purges and strengthening BDS is our way to neutralise Balfour. What is interesting about the Balfour letter is the wording prior to the statement that begins ‘His Majesty’s Government view with favour…….’. See the 3rd line of the 1st paragraph, ‘declaration of sympathy with Jewish Zionist aspirations’. Not Christian or non-Jewish Zionist aspirations but specifically Jewish Zionist aspirations. But if HMG supported these aspirations, the words that followed in the second paragraph were largely meaningless, as they did not accord with Jewish Zionist aspirations. 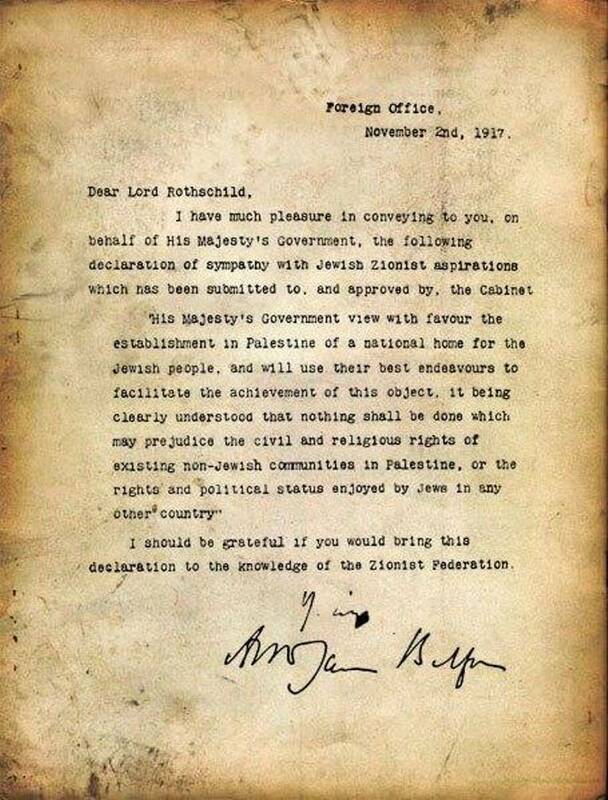 So, was the Balfour letter just meaningless where the rights of the Palestinians were concerned? It would seem so, as their rights were not allowed to take precedence over Zionist aspirations.